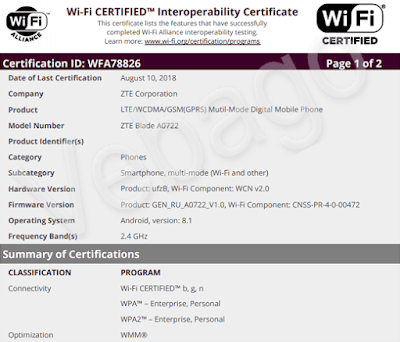 Home / Leaks / New Leaks / Smartphone Leaks / ZTE A0722 / ZTE Blade A0722 / ZTE Blade A0722 Features / ZTE Blade A0722 Specs / ZTE Blade A0722 clears Wi-Fi Alliance and 3C Certification in China, Launch Imminent? 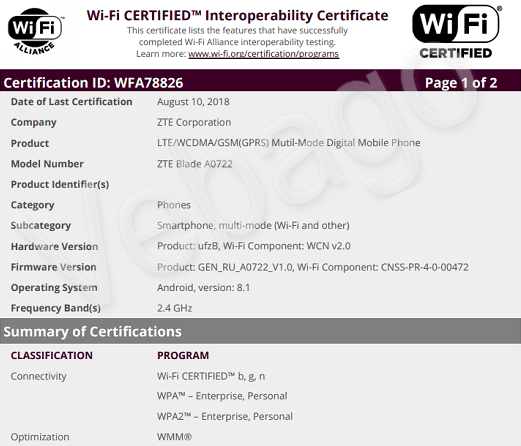 The upcoming Mid-range smartphone from ZTE which was certified on TENAA last week with model number A0722 has now certified on Wi-Fi Alliance, and 3C certification, which means the phone will launch very soon. As per the specs revealed on TENAA the ZTE Blade A0722 comes with a 13MP camera on the rear with an led flash and has a 5MP front-facing camera for video calling and selfies. The smartphone measures 147 x 69.5 x 7.9 mm and weighs 135g. It has a microUSB port and a fingerprint scanner on the rear. The ZTE Blade A0722 runs on Android 8.1 Oreo and is powered by a 1.4GHz octa-core processor. The device packs a 3GB and 4GB RAM variants with 32GB and 64GB of storage respectively. Both the variants can be expandable up to 128GB using a microSD card. It has a 5.45-inch minimal bezels display with a 1440 x 720 resolution, and the device will be available in Black and Blue color options. The ZTE Blade A0722 smartphone comes with a 3100mAh battery. The launch date is still not yet known, we will keep you updated stay tune to Vebago for latest technology updates.